In sport, there’s the win and then there’s the story behind the win. 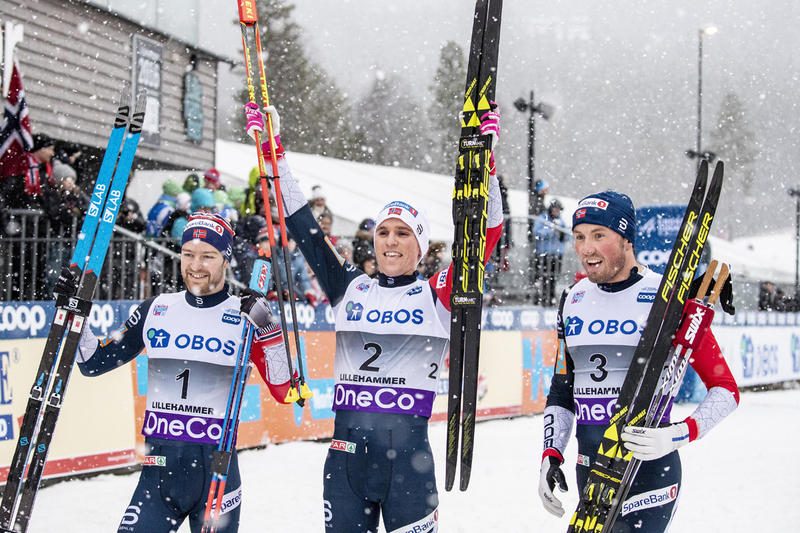 In the sport of nordic skiing, some of these stories seem all too familiar, such as Sunday’s Norwegian victory in the men’s 15-kilometer classic pursuit. But even among the Norwegians in the sport of cross-country skiing, there are idiosyncrasies to the success. In the case of Didrik Tønseth, the Norwegian winner of Sunday’s 15 k pursuit in Lillehammer, Norway, the victory was a long awaited recognition. Back in 2014, while competing in the Davos, Switzerland 15 k classic pursuit in early December, Tønseth crossed the finish line after Norwegian Martin Johnsrud Sundby for second place. Two years later, Sundby was stripped of the Davos 15 k win, as well as his 2015 Tour de Ski and 2014/2015 overall World Cup titles, due to a doping violation. Sundby had been found to have twice exceeded the amount of salbutamol, also known as albuterol, which Sundby indicated he used for asthma. The doping allegations and Sundby were under the spotlight. Few media outlets focused on Tønseth, the fact that he became the new race winner of the Davos 15 k, and that it was his first individual World Cup victory. He would have to wait until this December before another individual World Cup win would come his way for a toast to his individual victories. Tønseth now has two individual World Cup wins–the Davos 15 k from 2014 and this Sunday’s Lillehammer pursuit. “It feels incredibly good. It’s fascinating that I succeeded so,” Didrik Tønseth told NRK according to a Norwegian translation, also confirming to NRK that it was his greatest day as a cross-country skier. “It actually means everything,” the 27 year old added. Tønseth’s win this Sunday came in a time of 44:13.8 minutes. He earned the pursuit’s second start position, thanks to a second place finish in Saturday’s 15 k freestyle race. He was also, reportedly, the only Norwegian to race on zeroes on Sunday. Still, Tønseth hardly skied alone during the pursuit. He and Norwegian Sjur Røthe started within one second of each other and the two continued to set the pace for the remainder of the race. Just before the third lap the day’s snowfall picked up drastically. Røthe and Tønseth, however, remained untouchable by the chase group, which was a little over a minute behind at the 8.3 k mark. In the final double pole showdown to the finish line, Tønseth bested Røthe by 1.6 seconds to take the win. Snagging the final podium spot by 1.1 seconds ahead of Sweden’s Calle Halfvarrson was Emil Iverson in third (+1:03.3). Halfvarrson took fourth (+1:04.4) and one tenth of a second behind the Swede was Russia’s Alexander Bolshunov in fifth (+1:04.5). 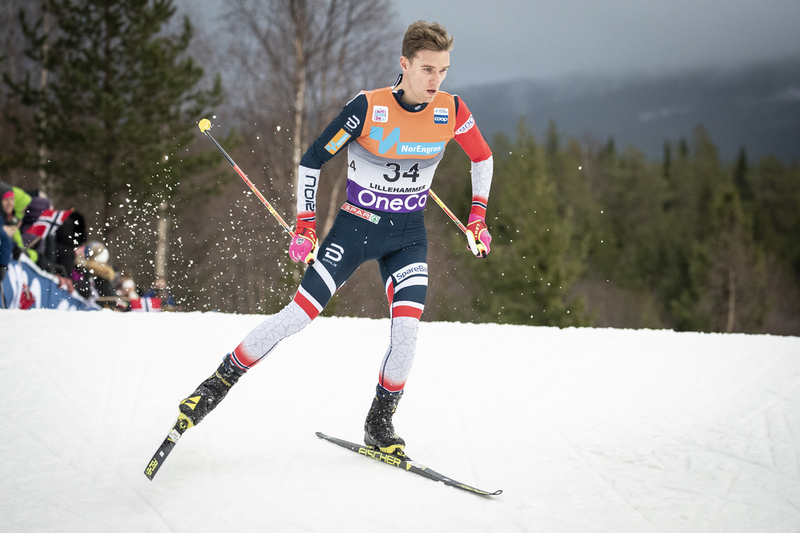 Rounding out the top ten was Russian Andrey Larkov in sixth (+1:05.0), Finland’s Iivo Niskanen in seventh (+1:05.2), Norwegian Simen Hegstad Krüger in eighth (+1:05.3), Sweden’s U23 skier Viktor Thorn in ninth (+1:05.5) and Dario Cologna of Switzerland in tenth (+1:05.8). Leading the North Americans was Canada’s Alex Harvey in 16th (+1:08.7). Harvey started the pursuit in bib number 10, sandwiched by Great Britain’s Andrew Musgrave starting in bib nine and Norway’s Hans Christer Holund in bib 11. After chasing down and catching up to Sundby and Cologna, Harvey remained in the main chase pack through all three course laps. 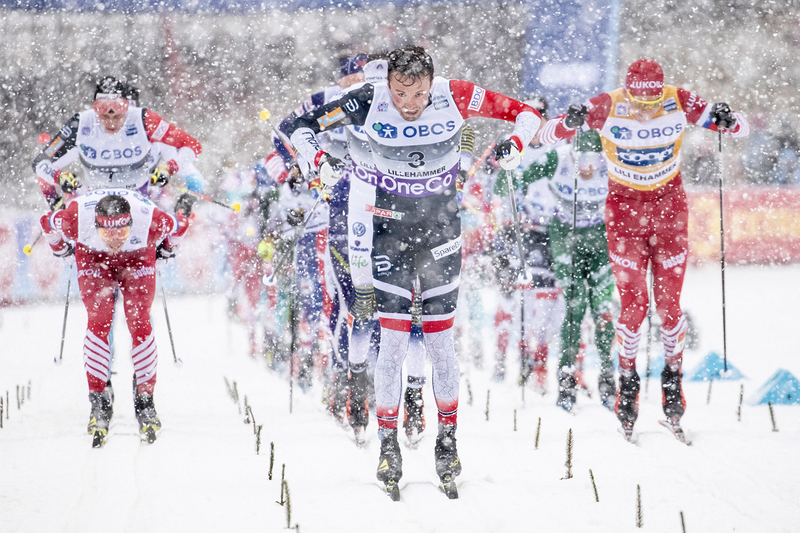 “[The first lap was the hardest, I had to close a decent gap, up to Dario [Cologna] and Sundby,” Harvey told Faskier during an in-person interview after the race. “They were closing on [Denis] Spitsov and these guys, so the first lap was the hardest for me, second was super easy, and first half of the third lap was also really easy. Finishing 7.9 seconds outside the top 30 in 32nd (+1:26.1), was U.S. Ski Team (USST) B-team member, Erik Bjornsen. Bjornsen ended the day with the third fastest course time. Whitcomb explained that the result is a positive indication of Bjornsen’s direction this season. Following Bjornsen, American David Norris (APU) skied to 52nd (+3:21.9), Kevin Bolger (USST) 59th (+4:20.8), Adam Martin (CGRP) 62nd (+4:35.7), Scott Patterson (USST) 63rd (+4:39.0), Simi Hamilton 66th (+4:44.1). World Cup cross-country athletes’ next stop is Beitostølen, Norway for the 15/30 k distance events and a relay.